at The Palace Stage at Wild Tymes in downtown St. Paul. On Friday, 12-03-10, I had plans to meet Kim in St. Paul to see Felonious Bosch. Kim told me on to them a few months ago. She knew I’ve listened and photographed Steve Clarke before so she figured I would like this bands music. They have been playing at the 42nd Avenue Station in Minneapolis a couple times a month. We planned to meet at 7:30 pm. I was hoping to get there sometime between 7 to 7:30 pm. It had been snowing and there were several inches on the ground already when I left my home. I got a call from Kim about the time I got onto Hwy 252 from Hwy 610. She was checking to see if I was still going. She said her friend Tom wasn’t sure if he was going to or not. She really didn’t want to drive. I told her I would pick her up if she wanted. She called Tom, then me again. She gave me directions to her home. Well, we didn’t arrive at Wild Tymes until about 08:15 pm. I think other people were late, too, because the first band hadn’t started yet. Tom, Kim’s friend, arrived. About 10 to 15 minutes later, Bob Nordquist and the Intangibles began to play. Next up was Freeze Dried Fun. Finally, the third band and the one I was there to see , Felonious Bosch, was up next. 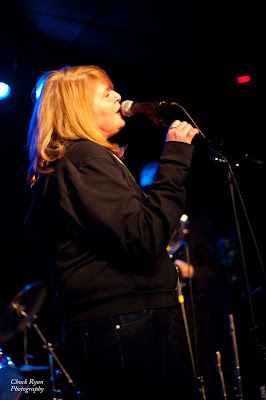 This was the first of two nights for their CD Release Party for their new CD, Toybox. The stage was 14‘ x 14‘ and a little small for me to get some really good shots of the six band members because they were so close together. Oh, well...I gotta take what I get. My shots ranged for an ISO setting between 2000 and 3200 with most at 3200. I really enjoyed listening to the band tonight. This was the first time I heard the band with Renee playing the full drum kit. This made the whole band sound even better. I would like to see the band play at another similar venue with Renee playing the full drum kit and for them to play longer...hint...hint!